For those of you not familiar with XBMC, its a VERY customizable media center application originally developed for the Xbox. 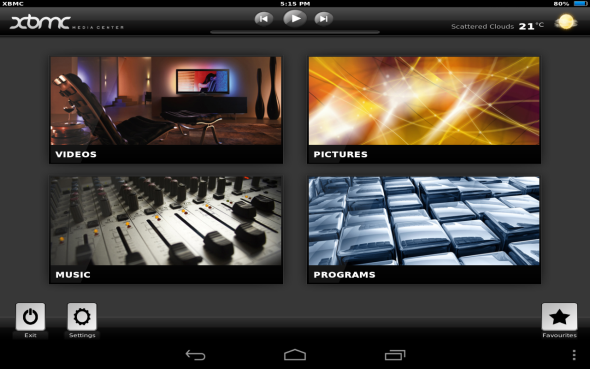 The XBMC app will play any media format you throw at it from basically any location. There is also a large library of add-ons, plugins and themes for it. XBMC has grown quite a bit over the years and has been available for Windows, OS X, Linux, and iOS for sometime now. Last month the XBMC team announced they were going to start supporting the Android platform as well, with XBMC for Android. While currently there is not a stable or official build available because the XBMC for Android version is still in development, the source code has been available for about 3 weeks. User Kermonie96 has used that source code to bring nightly builds of the app to any brave Android user who may want to try it. I’ve used it on my Nexus 7 tablet for a bit this afternoon and have to say I’m quite pleased with it. The last few nightly builds also include a “Touched” skin specifically designed for touchscreen devices. So if you’re keen to take XBMC for Android for a spin you can grab it from the XDA thread here. If you’re not feeling brave and would like to live vicariously through my adventurousness I’ve uploaded a short video of the XBMC app in action.